This beautiful Victorian peridot bracelet from the 1890s displays 8 octagonal step cut peridots, weighing 12.80 carats in total. It also features seed pearls, and eight rectangular pierced links decorated in flower motif. 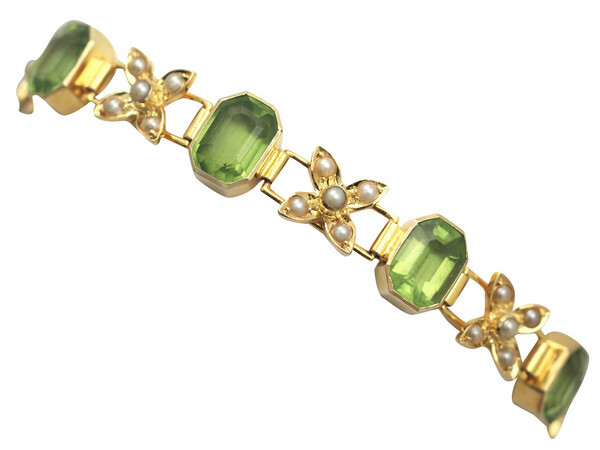 The peridot bracelet is crafted in 15K yellow gold, and comes with an additional fine link safety chain. The dimensions are as follows: the length of the bracelet is 16.5 cm (6.5″), the length of the peridot setting is 8 mm (0.3″), and the width across the peridot setting is 6 mm (0.24″).